This is based on a number of earlier maps, including de L'Isle's Louisiana/Mississippi River of 1718 --the relationship quite apparent. East of Mobile, it is quite different from de L'Isle. Great deal of explanatory text. Inset maps of Annapolis Royal Harbour and the New Orleans - Mobile area. Deep-colored inset scene: "The Indian Fort Sasquensahanok." 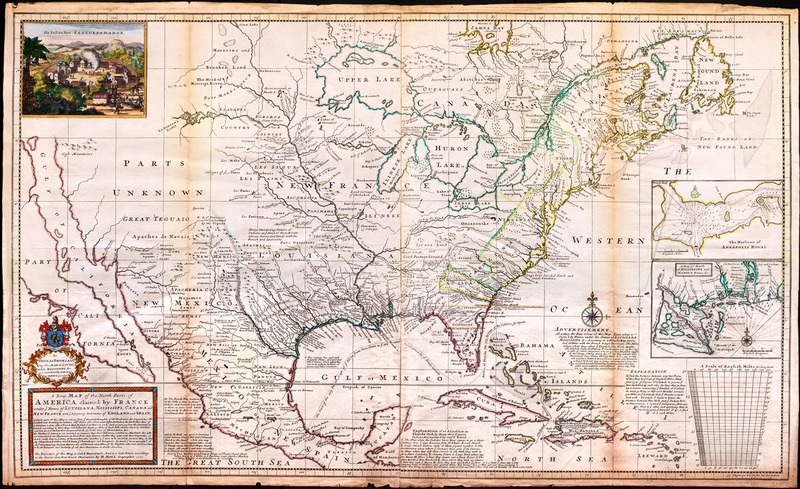 A new Map of North Parts of North America claimed by France under ye names of Louisiana, Mississippi, Canada and New France with ye Adjoining Territories of England and Spain . . . The projection of this map is called Mercator's . . . By H. Moll Geographer, 1720. George T. Abell Map Collection, MC 33. Archives and Special Collections, Mary Couts Burnett Library. https://archives.tcu.edu/repositories/2/archival_objects/14840 Accessed April 23, 2019.